The most recent edition of the Province’s forestry policy (2014) has been widely attacked. It has been seen as harmful to both forest sustainability and conservation, and has triggered considerable opposition. In 2015, a special issue of NB-Naturalist (a publication of Nature NB) outlined many of the concerns of the new policy. I recommend this edition to all interested in the management of our public forests. However, there was at least one article in the issue that I found concerning, and not in a good way. This article, by G. Hood and R. Moir (found in pages 34-39 of the issue), purported to compare the impacts of forestry management policy on ‘direct’ jobs in the forestry industry. Direct jobs would be those jobs provided directly by the sector. An indirect job would be one that was created in another sector as a result of spending by direct job employees or their employer. 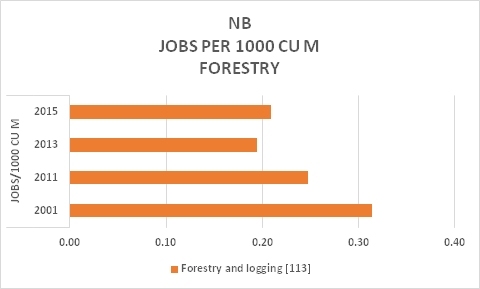 Calculations provided by the authors were used to claim that employment in the New Brunswick forestry industry might be improved if New Brunswick were to adopt forestry policies akin to those in other regions of North America. This was of interest to me, as I report on employment trends in New Brunswick. Comparison of employment numbers between regions or provinces in Canada is relatively straightforward as Statistics Canada reports those numbers using the standardized codes of NAICS (North American Industry Classification System). The article described above used certain of those codes to compare several Canadian provinces but, in addition, attempted to use data from US sources for comparative purposes. The article used ‘comparative’ data from the North East State Foresters Association (NESFA), but seem to have failed to verify the job numbers provided by the Association with government data, such as from the US Bureau of Labor Statistics or state governments. Now, the Foresters Association is an industry lobbying organization; hardly an impartial body. It seeks government funding and favourable regulation to promote its business interests. Why would anyone pretend that data from such an organization would be free of bias or lacking self-interest? An ‘apples to apples’ comparison would surely require data from an independent source using consistent coding of occupations, such as NAICS. Although BLS does not currently report job data using NAICS codes, some states do just that. Why did the authors not seek out those data? Furthermore, the article used only one year of data (2011). I found that to be rather peculiar, as it obvious that the forestry industry has seen a continent-wide downsizing in employment in recent years. Picking one year for comparative purposes seems fraught with danger. Suppose for example that, in region A, two sawmills closed in 2011 and that, in region B, two sawmills closed in 2012. A 2011 comparison would favour region B over region A, whereas a 2012 comparison might not. If you are trying to compare forestry policies with respect to employment, surely you would use a time series. Given those concerns, I decided to compare certain regions using a time series of forestry employment data. I selected New Brunswick, Ontario, and Vermont. Why those particular regions? Well, they were all used in the article referred to above, and I was able to find NAICS data for Vermont. Where did I find that Vermont data, you may ask? Well, it turns out that the Vermont Department of Labor reports data using NAICS codes. Several other states appear to use NAICS as well. Not sure why the authors of the article were unable to find or use those data but they do not appear to have done so. First, let’s compare NB and Vermont. We quickly get into the issue of what exactly is a ‘direct’ job. Logging and related forestry jobs would certainly be ‘direct’ jobs. But are sawmill and pulp and paper mill jobs ‘direct’ forestry jobs? That depends on whether the wood consumed by those mills comes from within the region or not. 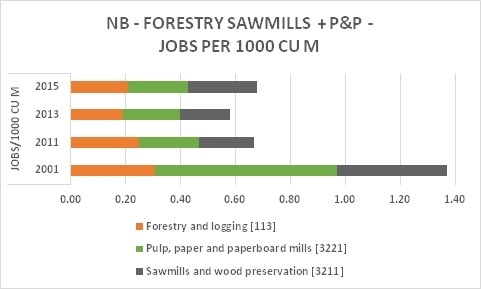 If, say, a pulp mill in NB sources 90% of its wood from NB, then perhaps we could roughly estimate that 90% of the pulp mill employees could be considered as direct jobs resulting from the NB forestry industry. Even that is a bit iffy as the mill might source 75% of its wood from within the region one year, but 100% the next year. And there is most likely not a direct correlation between wood consumed and mill employment. The larger the pulp or sawmill, the greater the region from which it draws its wood supply. On the other hand, the smaller the mill, the more likely it is to close (given today’s economics and cost of labour) unless they can charge a higher price for their product. Other types of mills, such as veneer and plywood plants, might be even less reliant on within-region wood. One would have to contact each plant or mill and determine the source of their wood supplies, then estimate how many of their employees could fairly be considered to be ‘direct’ forestry jobs. I will leave that job to someone else. It’s no more straightforward with some of the other jobs described as ‘direct’ in the NB-Naturalist article. For example, ‘paper manufacturing’ is only a direct forestry job if the wood fibre used in paper product production comes from within the region in which the plant is located. Vermont does not have any pulp mills and, therefore, the paper manufacturing plants in Vermont are not likely using fibre from Vermont to make paper goods. Unless evidence to the contrary is presented, those jobs should NOT be considered as ‘direct’ forestry jobs. Wood manufacturing jobs have the same problem. How can you prove those plants are using within-region wood and are therefore are ‘direct’ forestry jobs? A furniture plant might use Vermont wood; then again, it might be using wood from Quebec, Brazil or Indonesia. Nonetheless the authors made the assumption that the jobs were direct. That underlines the dangers of 1) allowing confirmation bias to drive your analysis, and 2) using data supplied by a US forest lobbying association without validation. Of course, a lobby group will try as hard as possible to promote the value of its industry and will, quite naturally, exaggerate its value. A good example is Figure 1 in the NESFA report which claims that there were nearly 1000 persons working in the forestry, logging, and forestry trucking groups in 2008. The source for their data (US Census Bureau) says, by contrast, that there were less than 200 persons employed in forestry and logging operations in Vermont in that year. Are we to believe that the remaining 800 jobs involved trucking logs and lumber? Don’t think so. The series of charts below were constructed using a time series and those NAICS codes most likely to represent direct forestry jobs. We include the years 2008-2011 as 2011 was the year selected by authors of the above article, and because the Vermont Department of Forests, Parks and Recreation provides harvest data only up to 2011. Harvest data were adjusted to a common volume unit (1000s of cubic metres) using a conversion guide. Canadian harvest data (thousands of cubic metres) are found here (data available up to 2013 only; 2015 data assumed to be similar). Unfortunately, the Vermont industry is quite small and, as a result, the Vermont Department of Labor does not seem to report on sawmill employment so we can’t include those numbers in our comparison. That suggests that sawmills provide very few full-time jobs in Vermont. We do include logging (NAICS code 1133) and pulp & paper (NAICS code 3221). Although, there were pulp mills in Vermont in the past, they have all closed. Pulp wood is now shipped out of state. By contrast, a few mills remain in NB. Employment data were taken from Statistics Canada Table 281-0023 and from the Vermont Department of Labor NAICS reports for each year. The annual data are the averages reported for each month in the year. There are two options for converting the US thousand board-feet (mbf or mbfm) into 1000s of cubic metres. One involves treating the harvest data as lumber, and the other treating the harvest data as ‘primary harvest’. The latter conversion nearly doubles the number of cubic meters, and, correspondingly, greatly reduces the number of jobs per 1000 cubic metre. I have provided the results for both conversions below. 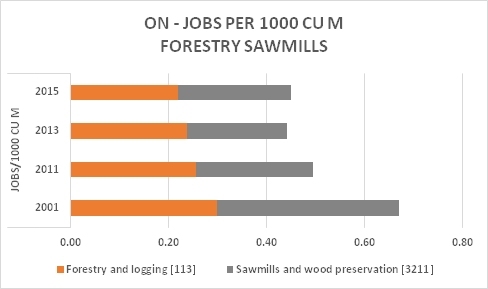 For the ‘lumber’ conversion, differences in jobs per unit of harvested wood are fairly small. 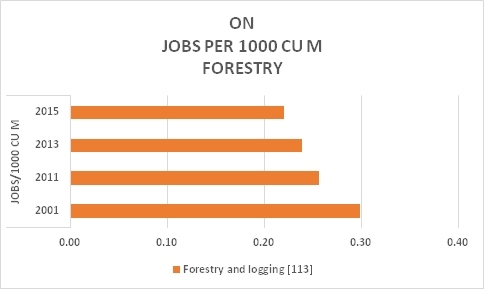 Despite supposed differences in forestry management, logging generates similar number of jobs per volume of wood harvested in both regions. That makes sense as industry generally strives to be as efficient as possible and labour is relatively expensive. 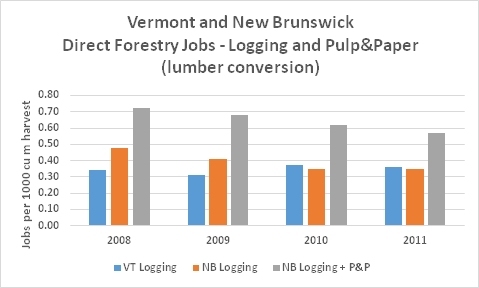 The pulp & paper employment values for NB are declining over time, consistent with other regions as demand for pulp falls and mills consolidate. Remember that not all of those pulp & paper jobs may be ‘direct’. 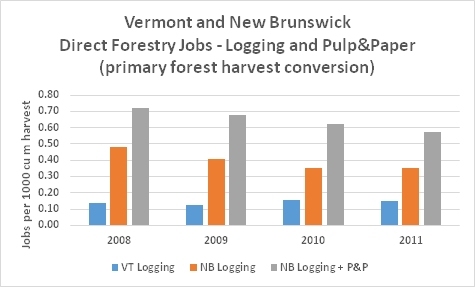 The ‘primary forest’ conversion results in significant advantages to NB with respect to job creation. Of course, one could argue that there are other ‘direct’ forestry jobs not included here. For example, maple syrup operations, cultivation/collection of wild mushrooms, fuel biomass operations, Christmas tree plantations, etc. All of these may generate income and create jobs. However, it is not clear how changes to crown forest management will affect those businesses to any great degree (a number of those businesses would operate on private land and not be directly affected by policies applied to crown forest), nor how any of them are actually inhibited by current policies in New Brunswick. Another aspect of employment is, of course, income. It’s not just about having a job, after all; the income from that job matters a great deal. I haven’t looked at average wages in these comparisons, but the minimum wage in New Brunswick is certainly higher than that in Vermont. When pulp & paper jobs are added, there is a small advantage for Ontario. But I wonder is that is sustainable. 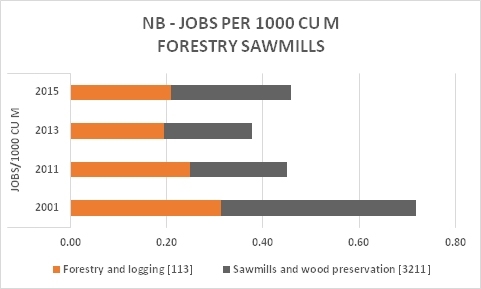 It looks like NAICS 3221 employment has declined more rapidly per volume of wood in NB than Ontario; is that a long-term difference, or will we see closure of several more Ontario mills over the next few years? 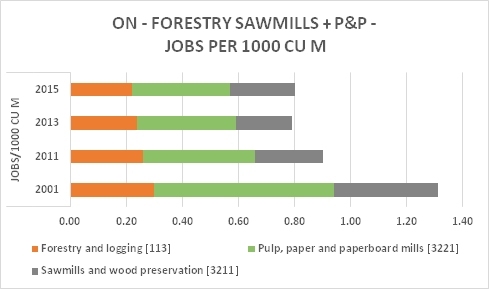 Again, I have not included veneer mills, or paper manufacturing plants, in these charts as we can’t verify the source of wood used. I’d also point out that, given Ontario’s population (and population growth) relative to New Brunswick, we’d expect to see a much higher local demand for value-added products in Ontario. Regardless of forest management policy, that could result in more value-added plants (producing paper products, engineered wood, furniture, etc) from local wood supplies simply as a result of location. That large Ontario population might also mean that the Ontario forestry industry is less dependent upon exports compared to New Brunswick and therefore less likely to be affected by upturns/downturns in that export market. Those factors serve to further complicate assessments of impacts of forestry policy on job creation. In conclusion, I do not think that a fair ‘apples to apples’ comparison of regions shows any particular employment advantages of regional forest management regimes. As the industry has become more mechanized, and as markets for traditional paper products have declined or become more competitive, employment in the sector has decreased. Those jobs are not going to come back to any great degree, and there is no basis for the belief that changing forest policy will change that hard fact. You can certainly challenge the new management strategy on an ecological services basis, and you can question the long-term sustainability of production under this policy. But jobs? No, I don’t think so. This entry was posted in Economy, Environment, Labour, Politics and tagged forestry by Datapoints_NB102. Bookmark the permalink.